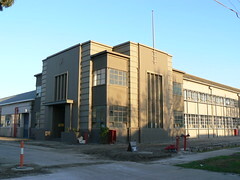 This building on Fishermens Bend, the largely industrial part of Port Melbourne developed around the outbreak of WWII, is the former Australian factory for the British motor manufacturer Rootes. I remember it as a storage facility for KMart and now the western end of the building is home to Melbourne Indoor Paintball. The building was built around the end of WWII and the national Archive of Australia holds two excellent photos of the building from 1945. Search for Image Number L1647 for a view of the building from ground level while L1849 is an aerial view showing the extent of the factory at that time. 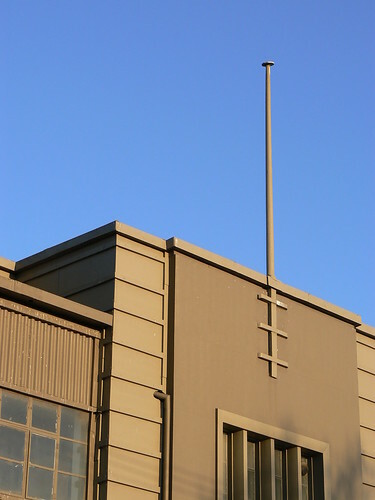 You will have noticed the flagpole, an Art Deco steadfast, but if you look closely at the face of the other wall in the first photo you'll also find another Art Deco steadfast, a clock. Unfortuately everything is painted in a two-tone Mission Brown selection which does the building no favours at all. It looks like it may have been white or cream or perhaps even grey in 1945. I was pleased to see the original gates, or at least one of them, still in place. Rusted in place actually, but it does show the Art Deco design and I can only image how good they looked 60 years ago. I've never seen a gate as nice as that. Thanks Janet. Very topical indeed. 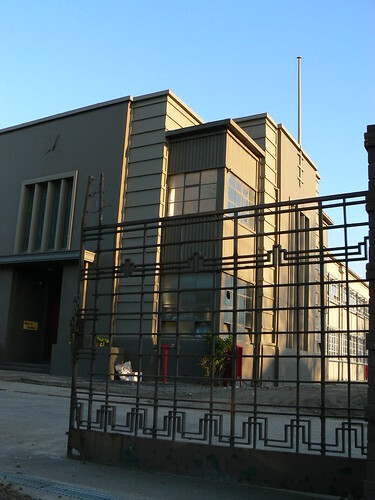 I saw from the map in the paper that the former GMH building, probably the best remaining Art Deco building on Fishermens Bend, is included in the State Government's area for housing development. I hope they are not going to touch that one. I'm glad to see from your blog post (http://portfocus.blogspot.com/2011/02/future-of-fishermans-bend.html) the City of Port Phillip are being pro-active to see what effect it will have on our part of the Bend. Andrew, I've been past this building so many times but never noticed the gate because it is permanently open. It came as a lovely surprise when I stopped and started taking pictures. David Today I was looking through some of Alison Kelly's photos and was reminded that Swallows was once too that rather unappealing shade of brown. It was too. Did someone in Port get a 'job lot' of Mission Brown?